The center not only acts as VFV’s office and headquarters but also runs as a local community center that offers a broad base of empowerment programs and social welfare services to a diverse collection of community demographics. Part of VFV’s unique success is owed partially to the combination of services it provides for various members of the local community. For instance, a child from a low income family may get the opportunity to be enrolled on our Child Sponsorship Program, whilst his mother may participate in micro-financing seminars and livelihood development projects with VFV’s Mothers Club. At the same time, the child’s older siblings may get the opportunity to join Boys Club or Girls Club to help further develop their personal skills whilst younger siblings could begin their first years of life participating in VFV’s Playtime session to fine tune their cognitive, motor-function and social skills. Aside from this, VFV also strives to maintain a safe and livable local community by annually contributing to local community restoration projects. Over the years VFV has augmented support to the local community by developing a central plaza and assisting with the drainage and irrigation system to prevent flooding of local residences. In addition to it’s local community projects, Volunteer for the Visayans Community Program also works in outlying areas of Tacloban City and neighboring municipal towns to supplement support to a number of different projects. 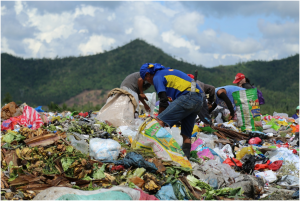 Its most notable and successful project is it’s Dumpsite Project, which over its seven year history has striven to rehabilitate children working in a local dumpsite by giving them the means to go to school. This project came to ahead in 2010, when VFV’s first Dumpsite Child graduated from High School. VFV’s strong focus on education has also seen further projects develop, such as the Adopt-A-School Project, which aims to provide school supplies to some of the local areas most remote and underfunded rural schools and the Build-A-School Project, which in recent years has seen five school buildings be built in Calbayog City, Samar. In addition, VFV continues its commitment to Public Health every year through it’s annual Medical Mission, an endeavor that provides free medical services to some of Leyte and Samar’s most undeserved and impoverished communities. Through the Community Program, VFV is able to provide a multitude of different services which are partially funded through VFV’s social enterprising model. Nevertheless, VFV is still dependent on donations to augment support to it’s ongoing Community Projects. Should you have any questions about how you can assist any of our projects, please contact us.